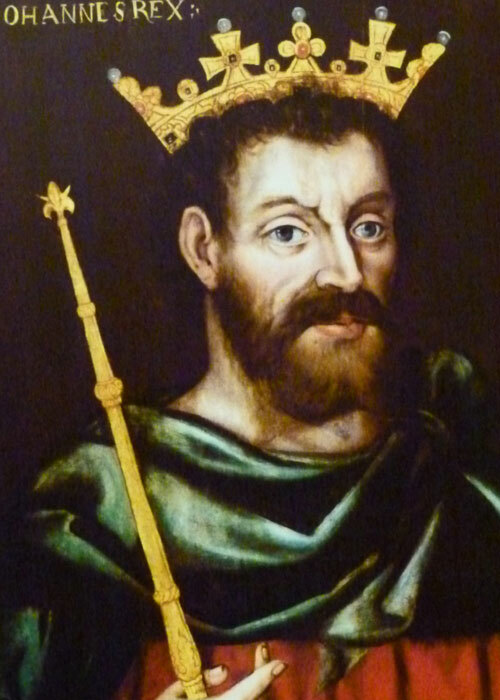 So far, England has only had one King John, and he was a bad ‘un. However many times some historian suggests that this much-maligned monarch has been misrepresented, misunderstood, or was at least no worse than any other medieval king, another historian shouts out that John was as bad as they got. In fact, by most accounts, King John appears to have been untrustworthy, shockingly cruel, a depraved sexual predator of the lowest sort and, most unforgivable of all, incompetent. The authenticity of the real King John has of course been camouflaged for most of us by seemingly endless stage and screen representations as a kind of pantomime villain, often pitted against a heroic Robin Hood – who, ironically, is a mere legend. The suggestion that John’s death was caused by the sin of gluttony was good propaganda that added to his unsavoury reputation; other sources suggest he was poisoned, emphasising his reputation for being hated. The poor lad couldn’t win. Modern historians believe he actually died of dysentery, and tradition is that he expired in the great gatehouse of the Castle at Newark-on-Trent. There is no public access to the upper room where this is supposed to have happened and, in its ruinous, green-mildewed, state, the place where one of England’s most reviled kings gasped his last exhausted breaths looks as bleak and forlorn as a death chamber can be. To cap it all, the story goes that John’s attendants deserted him at the last and servants looted his room. Yet, he was granted enough respect for his body to be taken to Worcester Cathedral and given a decent burial. It is interesting that the charter mentions constructing Newark Castle from the fishpond and diverting the old Roman road, the Fosse Way. 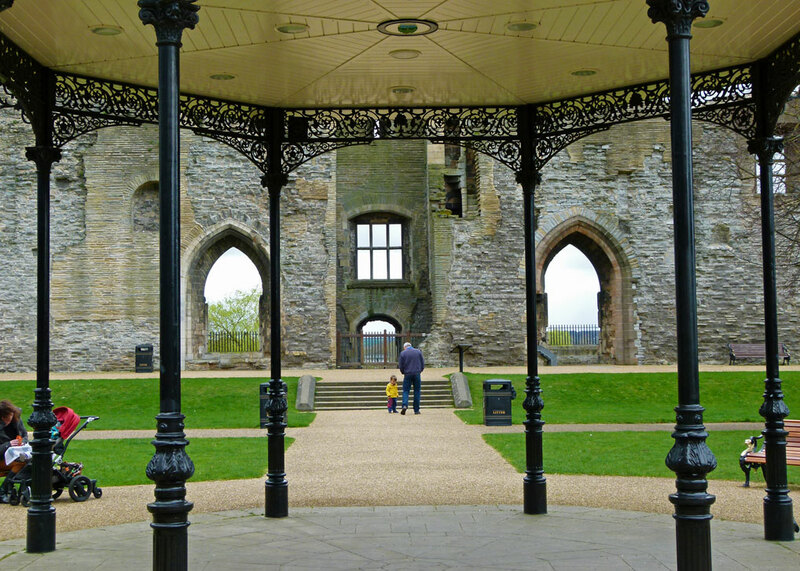 This might explain why Newark Castle has such an unusual, oblong, shape. It occupies a strategic point in the English Midlands, where the Fosse Way meets the Great North Road at the River Trent. Henry also gave Alexander permission to build a bridge there. 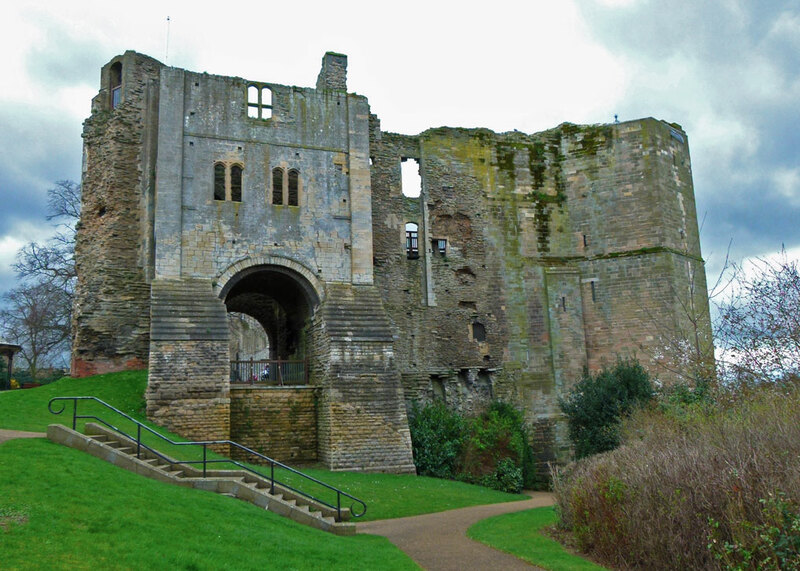 King John had entrusted Newark Castle to one of his mercenaries, Robert de Gaughy. Following John’s death, the new king, Henry III (John’s nine-year old son) ordered de Gaughy to give up the castle to the Bishop of Lincoln. De Gaughy ignored this instruction, as well as several no-nonsense royal reminders, and in 1218 a strong force was despatched to take the fortress by force. After a week’s siege, de Gaughy was persuaded to leave in return for £100 of silver. 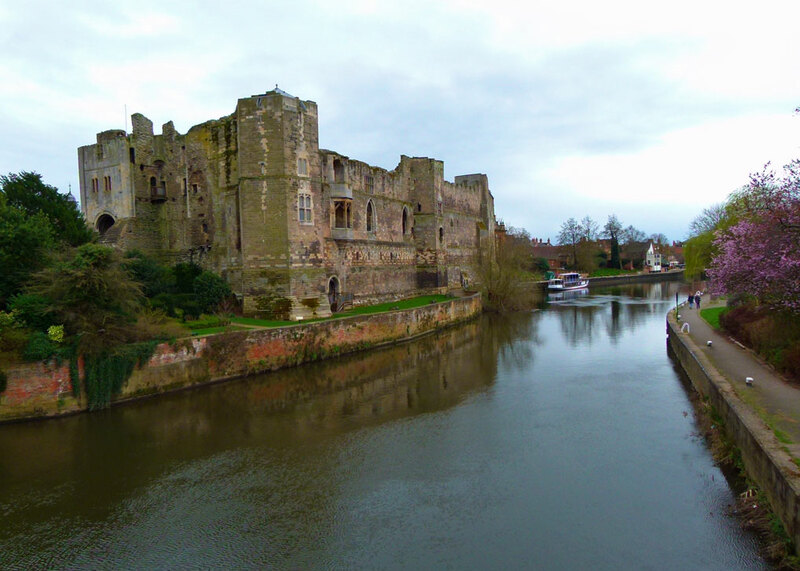 Sometime after the siege, probably around the end of the 13th century, Newark Castle’s river curtain wall was rebuilt and several other improvements made. 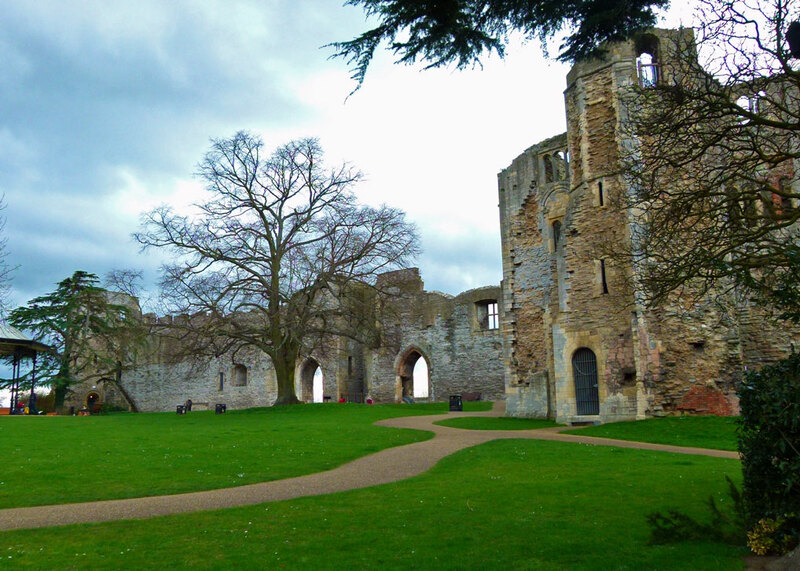 For a while in the 14th century, the castle was in the hands of Donald, Earl of Marr, who was a nephew of Robert the Bruce, and he carried out further improvements before the castle was handed back to the Bishop of Lincoln. Considerable alterations took place again in the late 15th century under Bishop Thomas Rotherham, before the castle reverted to the Crown at the Reformation, in 1547. Following a period of neglect, much-needed repairs were made by Sir William Cecil (of Burghley House fame), including the insertion of rather splendid windows on the river curtain wall. By this time, Newark Castle had been transformed from an Episcopal Castle to a rather nice fortified Tudor residence, suitable for both James I (VI of Scotland) and his son, Charles I, to stay in; which they did. The second big event in the story of Newark Castle was the English Civil War, which broke out on 22nd August 1642 when King Charles I raised the Royal Standard at nearby Nottingham. Given its strategic position, Newark-on-Trent has often been called ‘the key to the North’ and held out for the Royalist cause. The town was besieged three times – in February 1643, February 1644 and, in the wake of the decisive Parliamentary victory at Naseby on 14th June, for a third time from the end of November 1644 when it was surrounded by two armies, one Scots, one English. It eventually surrendered only on the direct instruction of Charles I who, seeking to drive a wedge between rival factions in the two armies that faced him, surrendered to the Scots’ commander, Lord Leven, at Southwell. One of the demands of Charles’ captors was the immediate capitulation of Newark, which happened on 8th May 1646. The role of Newark during this bitter war is another story – there is an excellent Civil War Museum in town, the National Civil War Centre. The castle was ‘slighted’ – dismantled sufficiently to prevent it being used again – by Parliamentary forces following the surrender. 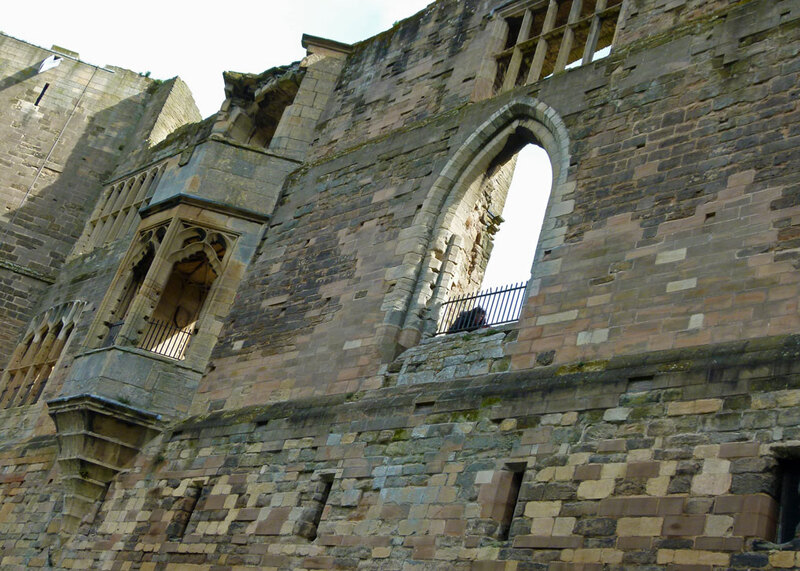 Allegedly, the blackening of the stonework around the gatehouse was caused by the gunpowder the troops used. The walls of the castle still bear the marks from Parliamentary cannon fire, too. Thereafter, Newark Castle became derelict, many of its stones re-used elsewhere by the town’s residents. It was occupied by squatters, had cottages built in its courtyard and eventually became the site of a cattle market. However, it was restored again between 1845 and 1848 by architect Anthony Salvin. In 1889 the Corporation of Newark opened a landscaped public garden on the site of the castle’s former courtyard, in honour of Queen Victoria’s Golden Jubilee of 1887. 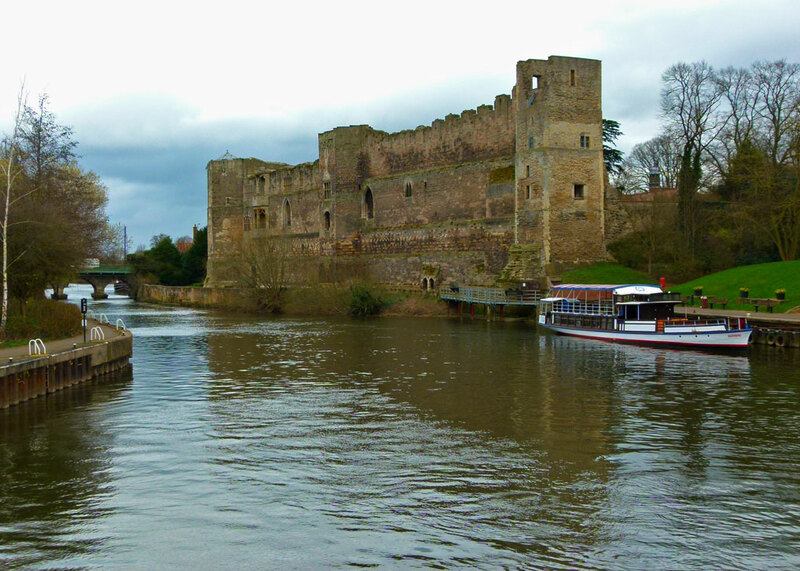 And there is the Castle of Newark-on-Trent today. 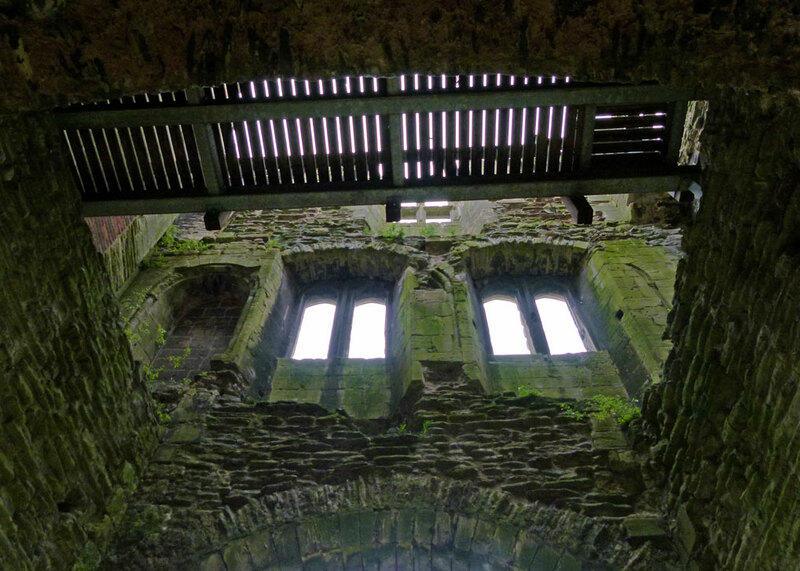 Half a castle, really, though you can get some sense of the former splendour of the great hall and apartments that once graced the river curtain wall, and the power of the mighty gatehouse – the best Norman gatehouse in the land, apparently. It’s a place for wheeling prams and, on a good day, having an ice-cream; hard to picture the scene when John arrived here, drained and dying, eight centuries ago; or the fear and determination of the defenders facing their own countrymen less than four centuries ago. Yet, in the historic shadows behind the trim garden, bandstand and neatly repaired stonework, these things happened. 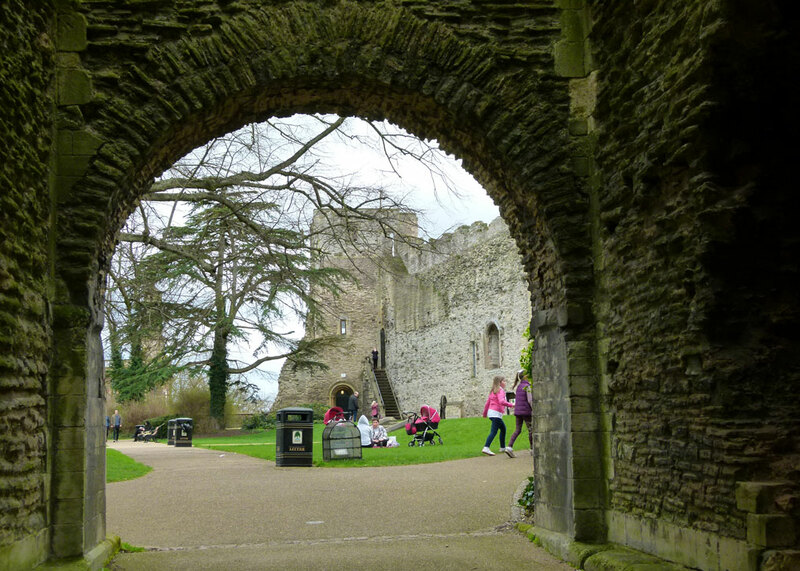 There’s actually more to Newark Castle, behind closed doors, than meets the eye. This includes a fairly limited exhibition on King John and, so it is rumoured, a tour of the dungeons and another of the towers. Alas, no plan survives contact with the enemy and it appears the tours need to be booked online/had finished/were not available the day A Bit About Britain decided to visit. Further, on checking after the event, the tours seem relatively expensive. None of this detracted from a perfectly pleasant hour or so wandering round the walls, but if Newark and Sherwood District Council, who are responsible for this major asset in their town, have a cunning plan for developing it (and I hope they do), this should include a small but vital section dedicated to visitor engagement and improving the website. A man dying of dysentery (whether from peaches or poison or a swampy dip looking for lost jewels) would have smelled bad enough that, once it became clear that staying nearby was not going to aid the man, his attendants might well give up just to breathe fresh air. Dysentery was a huge problem for warfighters for centuries, although we have few records of Kings dying from this scourge that was common amongst lesser soldiers. That’s a fair point. And you’re right about dysentry being a major problem for armies on campaign. Thanks for dropping in and leaving a comment. Most of us who live in Newark, or nearby, love our castle. Not only is there plenty of history for us to enjoy, there are many events held here. Most are connected to the Civil War, with enactments by the Sealed Knot, as well as some relating to John – especially last year with the anniversary of the Magna Carta. Concerts and festivals also use the site. An archaeological dig here some years ago (early ’90s) unearthed some interesting finds, including Roman and Anglo Saxon artefacts. An interesting read, Mike. Considering I don’t live that far away, I have never been to this castle. Thank you for the interesting history, I must add it to my ‘To Do’ list. It’s still a great castle and I loved learning more about King John, which is a historical character we love to hate! Some great photos, Mike – I like the Cecil windows too! I didn’t realise so much of the castle was still standing. A marvelous place to visit, I think! That’s quite a history! I remember writing an essay in Year 7 on whether John was a good or bad king, though I’d like to do more research on the subject now. Also, I like Cecil’s windows – they add a touch of 16th-century sophistication. I always sort of felt sorry for old John Lackland, considering his family life it’s a wonder he didn’t turn out worse. I love your introductory photograph. I really enjoyed reading your post too. Looks like there are houses nearby – that seems so strange to this American. 🙂 As for how John died, it must have been dysentery; how could anyone be blamed for eating too many peaches? I had a bad experience with dried bananas once. An incredibly rich history. Love the river shot. What a great post – full of interesting information and some great photos. Thanks!